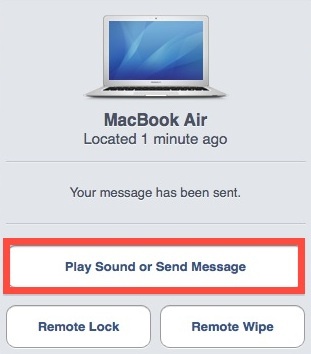 With iCloud and the “Find My iPhone” feature, you can send messages to your remote Apple gear. These come through in the form of a pop-up window in Mac OS X and a notification in iOS 5, and while there’s a variety of uses for this, it’s also a fun way to send a quick message to someone using your hardware, be it a loved one or a thief. 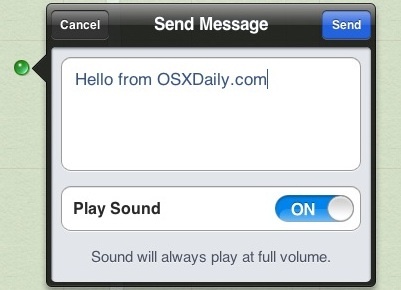 You can also choose to play a pinging sound with the notification, it will repeatedly play at full volume until someone acknowledges the notification, guaranteeing that it can’t be ignored. You’ll need iCloud enabled and have iOS 5+ on the iPad or iPhone, and OS X 10.7.2+ on the Mac, and all hardware must be sharing the same iCloud ID. Bonus points if you send a nice message to a significant other or loved one, or if you gently nudge your iPad hogging roommate who is addicted to Temple Run. Can you set Find My iPhone up on a Windows as well?